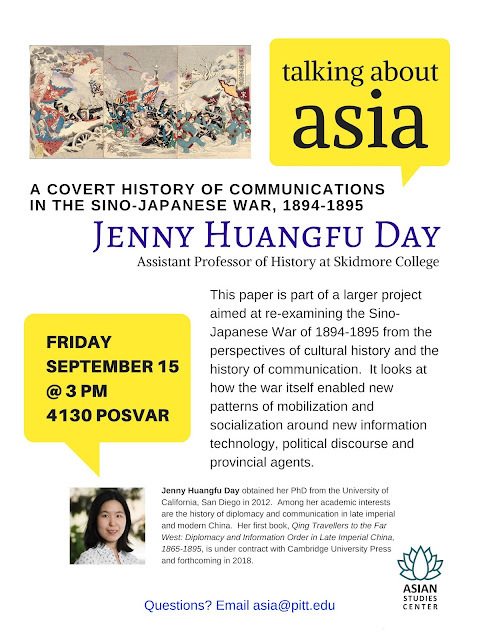 PennsylvAsia: "A Covert History of Communications in the Sino-Japanese War, 1894-1895", September 15 at Pitt. "A Covert History of Communications in the Sino-Japanese War, 1894-1895", September 15 at Pitt. The University of Pittsburgh's Asian Studies Center will host Dr. Jenny Huangfu Day and her talk "A Covert History of Communications in the Sino-Japanese War, 1894-1895" on September 15. This paper is part of a larger project aimed at re-examining the Sino-Japanese War of 1894-1895 from the perspectives of cultural history and the history of communication. It looks at how the war itself enabled new patterns of mobilization and socialization around new information technology, political discourse and provincial agents. The talk starts at 3:00 pm in 4130 Posvar Hall (map) and is free and open to the public. K-Pop Dance Practice, October 1 in Squirrel Hill. Operation Mekong (湄公河行动) at Pitt, September 22. Year of Indonesia at Chatham University.